This distribution requires Mac OS 10.10, Yosemite, or higher and runs on Intel processors. 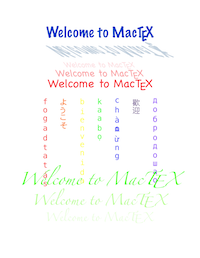 To download, click MacTeX Download. To download the smaller BasicTeX, click Smaller Download. For suggestions on keeping TeX up to date, go to Update Schedule. To Install TeXLive 2018 on older systems (10.6 and above) using the Unix Install Script, click here. Welcome to TeX! Now What? Happy TeXing on Mac OS X !